Not a fan of the color pink? Or have you been avoiding pink because it makes you feel like a girly girl? Or you don’t know how to wear pink without looking like candy floss. Read on… as this one is just for you. Yes, wearing pink can be a bit challenging but that should not be a reason to discard a color altogether. And with the winter season coming don’t you want your wardrobe to have something apart from the usual black and grey? So, we have come up with some ideas to make pink work for you without being called a Barbie doll. The best way you can incorporate the edge factor is by wearing well-fitted menswear. A pink blazer, vest or trousers can very well do the trick. It not only cuts out the sugar element but also makes you look distinctively stylish. When it comes to contrasting pink, don’t limit your options to black, white and grey. Create a shocking effect by mixing and matching pink with blue, green and purple. Trust us, you will look absolutely stunning! A pop of pink always comes as a rescue on a boring outfit day and works just right to edge up your look. Team your outfit with a pink tote, scarf, hat or belt. However, keep it to just one pink piece to add that pop. You can experiment with different types of pink accessories to create your own statement. Go off-beat by pairing your casuals with pink shoes or sneakers. 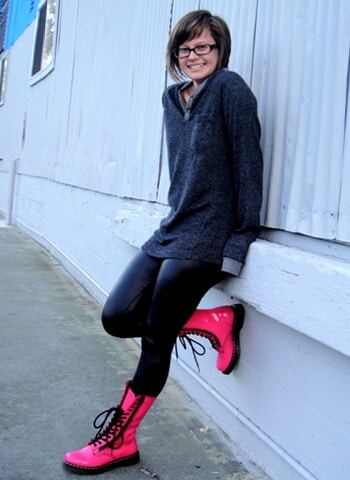 If you want to go bold, try a pair of pink boots. Complete the look with matching sunnies.